Kendra has been going through a lot in recent months. Recollections of childhood sexual abuse have begun to appear out of suppressed memories. To cope with them, she has turned to cutting. And while the self-abuse gives her a sense of release, her level of tension keeps rising as she becomes convinced that her abuser (who she cannot remember) is following her in an attempt to intimidate her and prevent her from identifying him (as if she could!). Her parents are both weak and ineffectual and Kendra's only allies are her Mom's gay friend Sandy, her therapist, and a new best friend at school Meaghan, with whom Kendra is falling in love (and who, incidentally, has significant problems with physical abuse at home). This is a very dark book, but if you can stomach these sorts of things, the novel has a lot to offer for itself. Certainly the story is riveting and will keep you hooked. I'll admit that I didn't care for the ending (the story veered off into a far too easy conclusion when the guns started to appear), but I found the characters compelling. It is always a bit of a challenge to take a victim like Kendra and make her strong yet believable. Yet in this case, Kendra's struggles seemed realistic (and it helps to learn that much of her sufferings were based on the author's own experiences -- it lends credibility to the overall story). That I'm saying this is significant as I've always found cutting hard to understand, and I really got it in this case. Kudos for getting through to the hard-to-reach! One thing I do wonder is where Rainfield will go next. Once you've written the fictional account of your life, what do you do for a second novel? It seems that she has the skills to write a less autobiographical book, so I hope she will and give us a taste of her skills as a writer, and not just as a survivor. Her own story was compelling, but I'd like to think she could pull it off with someone else's story as well. 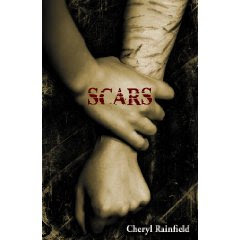 I know I've already told you - but thank you again for doing the review of SCARS. You are helping bring to light an issue that so many people steer away from talking about. It's such an important topic of conversation because so many secretly struggle with cutting.